It is extraordinarily rare for me to review a book when it's still on the New York Times Bestsellers List, let alone when it's occupying the Number One spot. I generally tend to let the dust settle before diving into that list. That's partly because the wait at the library for these books oftentimes takes quite a while, and partly because I generally don't fall for the hype. Once the dust settles, I check again to see how the book holds up under scrutiny. However, this book was just a little bit different. It's in the news, and many people are divided on it simply over political views than actual content. 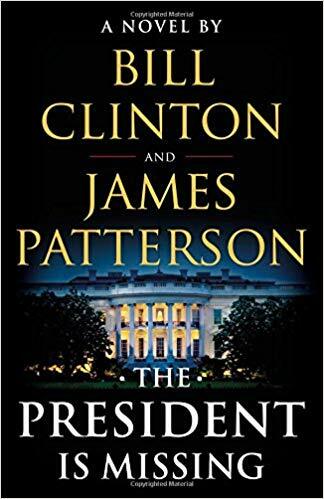 The President is Missing by former President, Bill Clinton, and author, James Patterson, is an intriguing look at the life of a President during the time of a terrorist threat. While the title is a bit of a misnomer, intended to draw the reader into a seemingly endless thrill ride to find the missing head of state, it does deliver on some action. But the President is never really missing. Jonathan Lincoln Duncan is the President of the United States. (Every fictional President in a novel must have three names, with one of those names echoing that of a former President. There must be a Writer's Guild Law about that.) While facing impeachment over possible collusion with a known terrorist, Duncan must deal with an impending cyber attack that would destroy the fabric of the United States, making it a Third World country with no defense. A young woman reveals to the President that she is aware of the virus that is in servers across the nation, waiting silently for activation and annihilation across all nodes of the Internet. Duncan meets with her partner surreptitiously in a public space, but all hell breaks loose. The young woman is killed, and the President is nearly killed. This urges him to go to ground, staying away from a mole in the White House. While he is surrounded by his security detail, is in touch with members of his team in DC, and is meeting with representatives from a couple of other countries, this is where the idea of the President being missing comes from. In the end, the President saves the day, finds his mole, and gets to deliver a very Bill Clinton-esque epilogue that neatly wraps up the entire novel. And it delivers a scathing rebuttal of Clinton's view of the current political atmosphere in Washington, DC. The President is Missing easily has the deepest plot of any James Patterson book that I've ever read. I would attribute that to the collaboration with President Clinton. 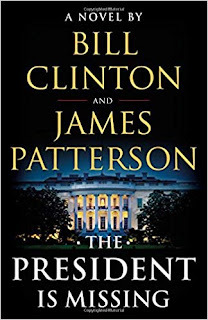 While blogger James O'Sullivan ran the text of this book through a program and determined that Patterson wrote a bulk of the book, I think the addition of Clinton added more flesh to the typical bare-bones publications that Patterson writes. However, the story is truly short on the thrill expected in a thriller. Duncan, as a character has no real personality until he delivers his speech to close the book. His staff are mere shadows who are placed in the plot solely for advancement of the narrative. The only character with a little depth is the young man who attempts to help the President deter the attack, and he is written as a petulant twenty-something whose ultimate destiny is a muddy mess. Patterson is known for his extraordinarily short chapters and this one is not much different. Overall, they seem to be just a bit longer than a normal Patterson chapter, but there are several one or two page chapters mingled in with the rest. It does keep the action moving, like quick scenes in an action movie. However, it did not deliver all the action that I was expecting. With Bill Clinton being a co-author on this work, I expected a bit more of the polish that we've long come to expect from the former President. Until the final pages, I don't felt we really got that. I also expected more behind the scenes look at the life of a President, especially coming from a man who lived it. I understand that there are certain details about the President's life that can not be disclosed for safety reasons. Still, it was short on that reality and heavy on a President ignoring everyone around him and going rogue. It was fun to consider the most powerful leader in the world actually having the power to be that character in real life although it would never come to be. Ultimately, this was an enjoyable book that was quick and easy to get through despite its hefty page count and near complete lack of character development. As always with James Patterson, you're getting a book that will not be taxing to read, and can enjoy while sitting by the pool. Bill Clinton adds just enough intrigue that you'll want to keep reading for his point of view, although not enough to push it to the top spot on the Bestseller list, in my opinion. Readers can sit back and enjoy The President is Missing for its simplicity and readability. You'll breeze through the 500+ pages with relative ease and feel a sense of accomplishment with that feat. Just don't expect it to be earth-shattering. Craig Bacon could be President. He already has the perfect slogan for his campaign. "Bacon Makes Everything Better.